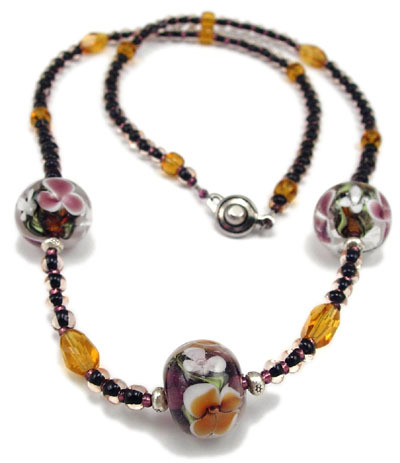 This necklace features 3 lampwork beads with amber and amethyst encased florals. Closure is a sterling easy-to-close ball and socket clasp. 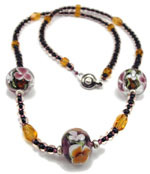 Lampwork is accented with faceted amber glass beads, and amber and amethyst seed beads. Finished piece is 21" long. 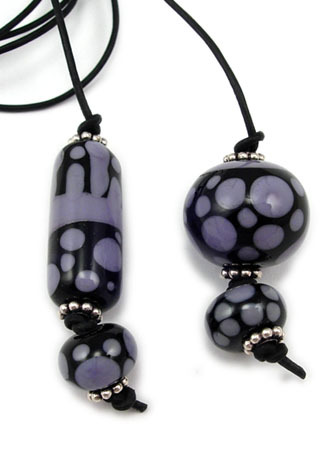 Lariat style necklace with 24x11mm cylinder bead , a 17x14mm round bead,a nd two matching spacers. Strung on 1mm cord with bali flower spacers. Measures 29" end to end. 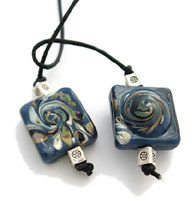 Lariat style necklace featuring 19x18mm Deep Tile and 19x19mm domed tile beads decorated with stormy swirls of color. Accented with square bali spacers, strung on 1mm black cord.